Isra wal Miraj – the Night Journey – every day's a holiday! On the 27th day of the month of Rajab, the Prophet Mohammad was resting after evening prayers near the Kaaba in the city of Mecca when he was awoken by the angel Gabriel (Jibril). Gabriel had with him a white, winged horse-like creature named Buraq. Gabriel then did a curious thing. He cut open the Prophet’s chest from throat to navel, removed his heart and cleansed it with Zamzam water, and poured into it a substance that fortified Muhammad’s wisdom and faith. Gabriel next asked Muhammad to mount Burak, and they began what is known in the Islamic faith as “the Night Journey”. 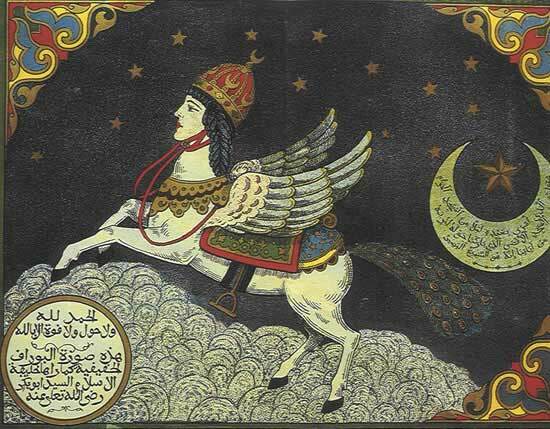 A single stride from Buraq measured as far as the eye could see, Muhammad later retold. Before much time passed the trio touched down in a land of palm trees, Medina. There Muhammad performed a prayer at Gabriel behest, and they were off again. Only this time they arrived at a much more distant location. The Masjid-al-Aqsa, meaning “the farthest mosque” in all of Islam. The city of Jerusalem. Along the way he saw many sights, including the birthplace of the Prophet Jesus in Bethlehem. Gathered together in one place at the mosque in Jerusalem were the prophets from Adam to Jesus, and Muhammad led them all in prayer. From there Muhammad and Gabriel began the final leg of their journey, up to the heavens. This is know as the Ascension of the Prophet. In the first heaven Muhammad saw Adam, the father of all mankind, surrounded by souls. If Adam looked to his left he cried, and if he looked to the right he laughed. For the souls on the left were his descendants who would die as non-believers; to his right, those who would die believers. In the second heaven he came across the Prophets Jesus (Isa) and John the Baptist (Yahya). In the third heaven was Joseph (Yusuf). In the fourth, Enoch (Idris). In the fifth, Aaron (Harun), brother of Moses, and in the sixth was Moses (Musa) himself. Finally Muhammad reached the seventh heaven where stood the patriarch Abraham (Ibrahim), the holiest prophet in Islam next to Muhammad. There Muhammad saw a sidr (lote) tree with fruit the size of the large jars and leaves the size of elephant ears. The sidr tree was said to be the tree Adam ate from before being banished. He ascended past the branches of the sidr tree, into Paradise, where he witnessed the many rewards that awaited the faithful. And when he had passed beyond Paradise, he heard the ‘Kalam’ (word) of Allah. The Kalam is likened to the language of Allah, but a language that doesn’t come word by word or letter by letter. Rather, it is one whole, eternal thing, without interruption. The Kalam instilled in Muhammad many things, including the importance and power of good deeds. God told Muhammad that his followers must pray fifty times a day. With that, Muhammad descended. But on the way down Moses asked him about what transpired. Moses said there was no way Muhammad’s followers would pray 50 times a day, and encouraged Muhammad to talk God down. Muhammad did this, and eventually talked God down to five times a day. Muhammad returned to Mecca that same evening not far from where he had begun his journey. Only, in this age prior to supersonic jets, some of the townspeople didn’t believe he could have gone all the way to Jerusalem in one night. Muhammad described the Jerusalem mosque and its surroundings in perfect detail. And then told them of an event he had seen on the way back to Mecca, shepherds searching for a lost camel far away. When those shepherds reached town, they verified Muhammad’s story. Today Muslims remember a key date in the history of Islam, the Isra and the Miraj, the Journey and the Ascension. i was looking for that what prophet muhammad (SWA) saw in the hells in the seven hells but ii couldn,t find it. you are a true writer, able to depict everything in an accurate way ! thanks for this article. i was looking for an article that would explain to me what Izra Wal Miraj is and you perfectly did that. thanks again! Dear in Islaam,assalaamu alaikum warahmatullah wabarakahut.Please kindly tell me what you know about the distance between the various heavens,because i read something about that according to abn Abbas that its about 5ooyrs journey between each heaven,and recently, the astronaunts have discovered a planet in goldilock that is about 20 light years away from the earth,which is equivalent to 1oo years journey.Wassalaam. i am very happy to know about .very simple explain n great article.thanks to GOD u give to Hidayat/enspire the article.